Redland Art Gallery, Capalaba will have what appears to be a sweet treat for visitors when Susan Gourley’s upcoming exhibition, A Consumer’s Guide to Unobtainable Happiness, opens on 13 October. The irony is that this installation of seemingly luxurious, mouth-watering French-inspired patisseries has been constructed using salvaged waste. This mimicry goes to the heart of the artist’s concern around mass consumerism in western culture. Through A Consumer’s Guide to Unobtainable Happiness, Gourley seeks to understand the impulse and drive of this phenomenon and, in particular, ideas relating to ‘luxury’ and ‘taste’ as emotive agents for consumerism. Gourley said these patisseries – with their ornate and textual qualities – served as a metaphor for ‘luxury’ and ‘taste’. recycled cardboard, polystyrene, and paper, plus modelling paste, adhesive, synthetic polymer paint, glass, paper and wire. Courtesy of the artist. “I also employ faux tableaux to emulate the enticement of the patisseries, as embodied in the aesthetics of display. 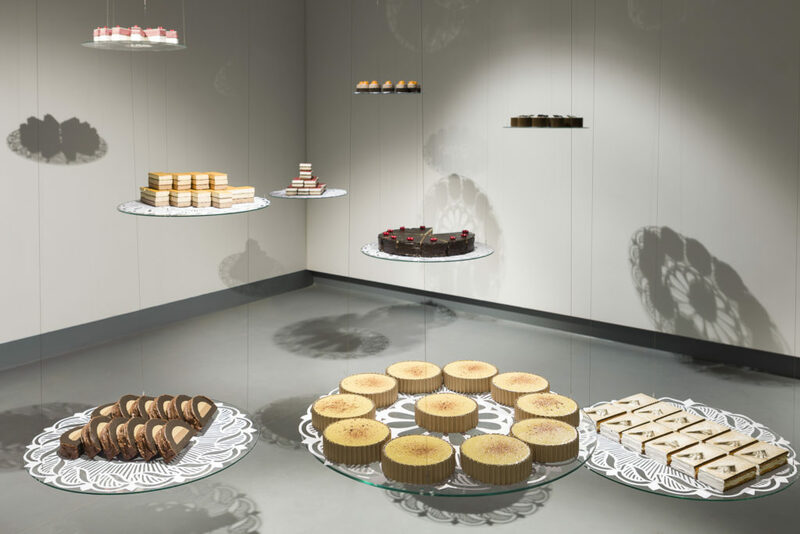 Made possible by the fact that the patisseries despite their desirable qualities, textures and allure, have been constructed from salvaged material including cardboard, polystyrene and paper. “Thus, while I am able to mobilise meaning through the transformative qualities of these materials, this body of work also utilises irony and paradox generated through the combination of mimicry, repetition and a meticulous level of craftsmanship to disrupt and destabilise the consumerist impulse,” Gourley said. A Consumer’s Guide to Unobtainable Happiness runs from Saturday 13 October until Tuesday 27 November 2018. Entry is free. For more information visit the Reland Art Gallery website. Posted in Arts, Cleveland, Community, Events and tagged .